For many of us, particularly those of us in large cities or places where folks speed straight from the front door to the car, it is incredibly easy to go about our days anonymously. We are known in our workplaces and homes and perhaps a few favorite shops or eateries, but as we walk down crowded streets and hop on public transit during peak commuting hours, we are surrounded by strangers who know nothing of us, people we may never knowingly see again. Sometimes, this is a blessing. Take, for instance, last week, when I was walking a familiar route to the train station, sunglasses in place more so I’d be left alone as I retreated home at the end of a long day than to shield my eyes from the sinking sun. Approaching the station, I reached to take off my sunglasses and found that one of the lenses was missing. I had a tinted lens covering one eye alongside an empty black frame encircling the other, and I somehow had not noticed during my mile-long walk. Strangely, no one had given me a second look. But, then again, this is San Francisco. This might be the sort of anecdote I should keep to myself, but it is just so ridiculous that I cannot. I am also grateful to be anonymous when I lap the grocery store upwards of seven times because I can’t decide which obscure flour I should purchase, or if I should or should not buy that bunch of carrots, or if my budget will allow that bottle of red wine that would be so nice to have on hand. Additionally: when ridiculous gusts of wind swirl my already voluminous hair into an enormous mane around my head, when I trip, when I have chosen to not shower following a run. I realize that in some cities and neighborhoods, this is far from the case. Even in my most recent place of residence—a good-sized, bustling city—much of my life was centered around a few neighborhoods. I frequented my favorite bakeries and restaurants and little groceries, and I knew plenty of people who lived on nearby streets or belonged to my gym. I would go to pick up a bottle of wine and inevitably find myself in an extended chat with a friend or acquaintance. Both of these scenarios have their benefits. We find community and comfort when we are known; we are free and unashamed when surrounded by strangers. But regardless, whether in an tiny, rural town in which everyone knows everyone else’s business or in a fast-paced metropolis packed tightly full of strangers, we want to be seen and recognized, to be understood and loved despite our flaws, to feel we are not alone. 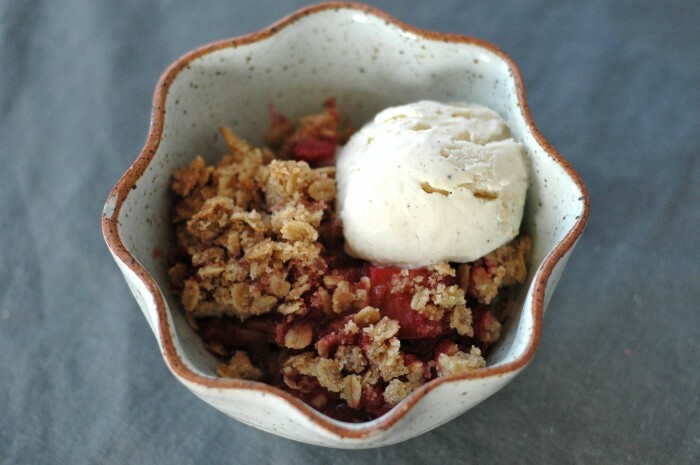 When I find the markets brimming with summery fruits, I think of the desserts my mother made when I was growing up: fresh fruit crumbles topped with ice cream, peach cobbler, quick bread dotted with flecks of pink rhubarb and sprinkled with sweet, brown sugar crumbs. I recall the pies my grandmother would make on our annual summer visits to South Dakota. She always baked more than one pie, a habit she has retained since the years in which the opinions of seven children, and their corresponding appetites, demanded it. Though various family members have their strong preferences to this day, I will attest that all of the pies that come out of that woman’s oven are delicious. Around these tables—the tall, square island perched in the middle of my parents’ kitchen, the round one always adorned with a flowery tablecloth that I would sit at with my grandparents—I knew I was loved, cared for, fed, part of a family. Perhaps that’s the feeling I’m seeking when I bake. I want to give that feeling to others when they sit at my table. I want to remember it myself. This is what I love about food. As we gather around it, we feel a sense of belonging—whether through the company we keep or in the way a dish sparks our memory or simply because we are tied together by the truth that everyone must eat—even when this eludes us in every other place. Our bellies full, our plates wiped clean, the evening’s laughter fading, we feel what is true: we are not alone. 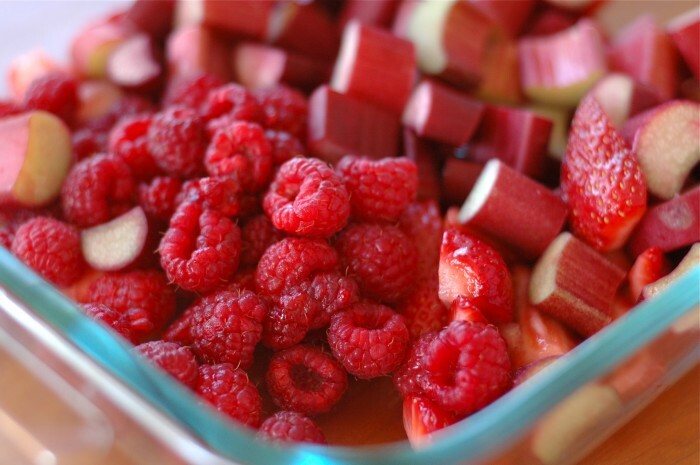 I was thrilled to find strawberries, raspberries and rhubarb all in season at once, and I think they’re lovely together, especially with the extra punch of ginger I’ve thrown in here. However, feel free to swap fruits in and out of this recipe depending on what is available in your region. 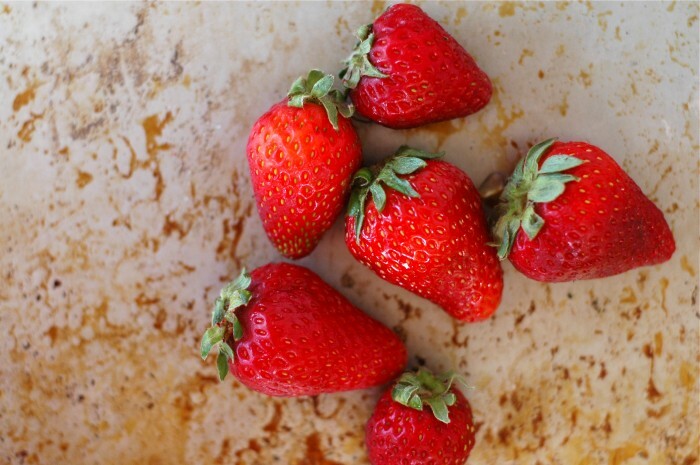 Using only strawberries or only raspberries would be an easy alteration. 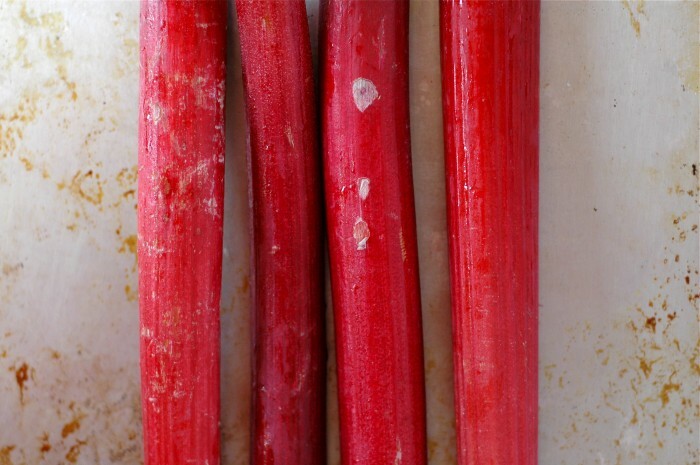 But if you change the amount of rhubarb, be sure to increase or decrease the amount of sugar accordingly, as rhubarb is quite tart. 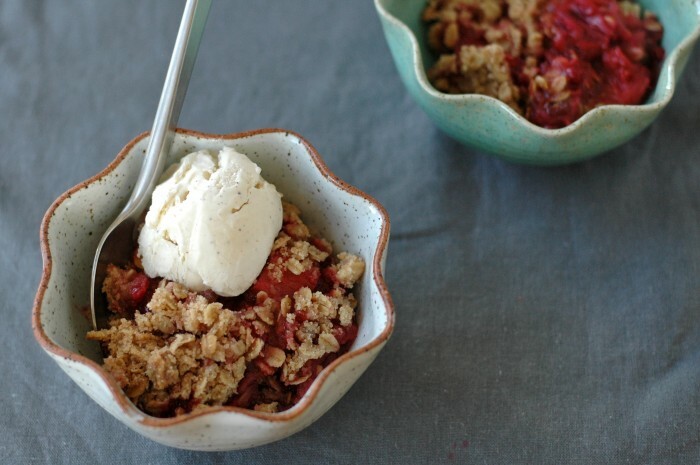 While the crumble easily stands alone, I recommend a scoop of vanilla ice cream. Yogurt and crème fraîche would pair wonderfully as well. 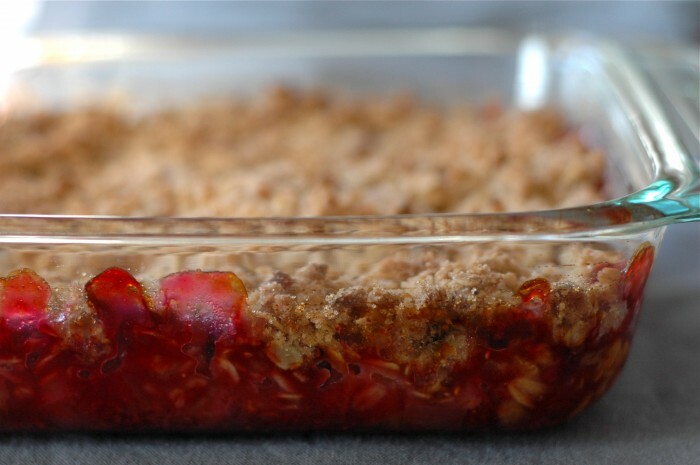 First, make the crumble topping. In a medium bowl, combine the oats, flour, walnuts, sugar, crystallized ginger, salt and spices. Add the coconut oil. With a fork and/or your hands, stir until the liquid is evenly distributed. The dough will be loose and crumbly. Refrigerate until needed. Place the sliced fruit into an 8 by 8-inch pan and stir gently to combine. Add the sugar, tapioca starch, ground ginger and lemon juice. 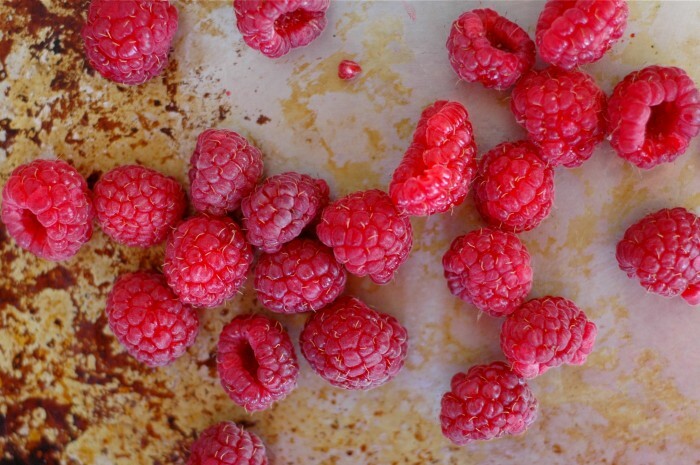 Toss until the fruit is evenly coated. Removed the chilled topping from the refrigerator. Crumble it evenly over the fruit filling. Bake for 30 to 35 minutes, until the filling bubbles and the topping is golden brown. 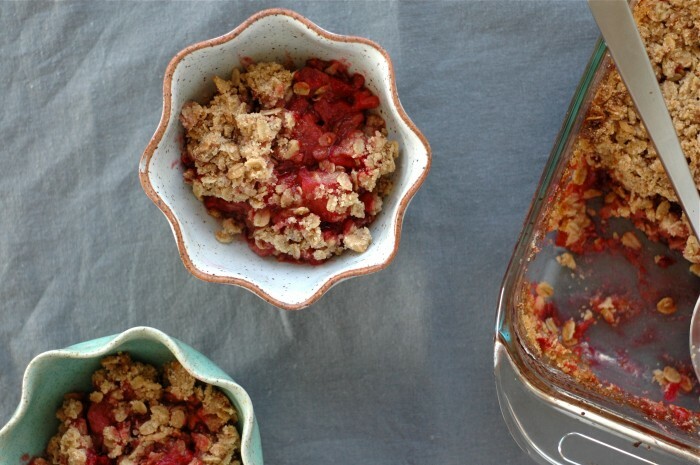 Allow the crumble to cool for about 15 minutes before serving. Serve with vanilla ice cream. Looks delicious! :) Loved the post. This looks so yummy. It will be a great addition to our weekend up north. Having lived in a “big city” for 38 years, I have learned to connect. I comment and smile and laugh with strangers on my hikes, and runs and dog-pulls around the neighborhood and in the stores….it often Makes My Day to receive a kind and empathetic response from another lone believer on this planet. I went to Tucson this week to a Tea and Empathy meeting. You like this. She cooks- a lovely artsy healthy breakfast and teaches “non-violent communication strategies.” It was very powerful. We have been in and out a lot lately. More than enough eating out, drinking, special treats and what not. Hugh made a note that as much as I LOVE food, I don’t really like going out to eat that much. Sure it’s fun every now and then, but I don’t love food for the mere fact that I love to eat, I love the part of feeding people and nourishing and being in good company. Like you said, “we feel a sense of belonging—whether through the company we keep or in the way a dish sparks our memory or simply because we are tied together by the truth that everyone must eat”… I love food for this reason. Wonderful line. Beautiful crisp. 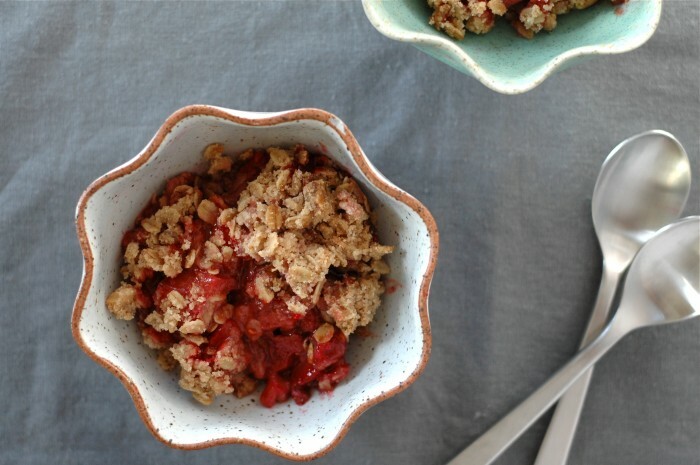 A good crisp recipe is a summer essential. Such pretty red fruits and those bowls are gorgeous too!